First of all, there is nothing "Caesar" about this salad. That being said, the dressing used here is delicious. Just a bit too tangy and salty, but the creamy avocado really stood out, and I think this could also make a fantastic dip (the leftover dressing thickened overnight). The cumin also comes through, but again my idea of "Caesar" certainly does not include a spice like this. The addition of the fried corn tortilla strips added enough crunch and Latin flavor to make this salad seem more complete. 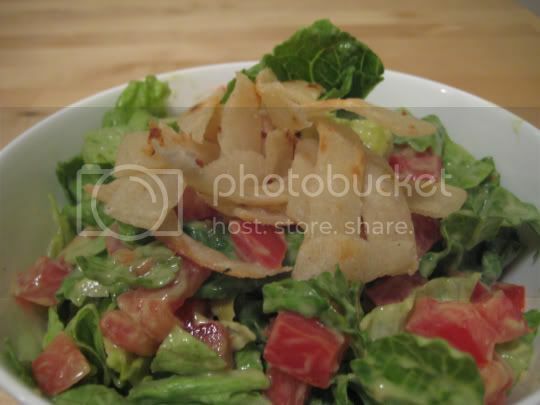 Be careful salting the strips after frying them however, as there is already enough salt in the dressing. Make again? Yes. Try cutting back on the salt next time.